His Chinese name is Sun Wukong. He’s linked with the Hindu god, Hanuman, and he’s a video-game character with games on just about every console, a longtime manga hero (the Yanks at Marvel just snapped him up as of 09/11), a rock band, and he’s played by Jet Li, opera singers, and ballet dancers in countless films and theatrical productions. He also makes an appearance with Marisa Tomei on Sesame Street. Now, that’s what we at Magically Real call a wide popular appeal. Who is this fascinating creature? Imagine Peter Pan combined with ALL the Little Rascals, and some of the wiliest tricksters from world folklore. Add a touch of Bugs Bunny. And throw in some Buddhist enlightenment. Shake well. And stand back. 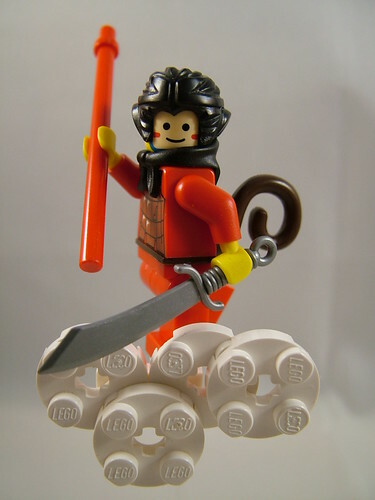 The Monkey King is a central character in the 16th Century Chinese novel The Journey to the West. The ostensible hero, the monk Tripitaka, is something of a dope, but Monkey keeps the plot of several hundred pages rolling with his shenanigans, magical powers, and innate desire to rock and roll. Eternally energetic and ready for a fight with robbers, Monkey King eats peaches, battles demons, and repeatedly goads Tripitaka into getting the heck on with the journey. He can transform himself into 72 different entities, and he can pull a hair out of his head whenever he needs to just “make” another monkey. So, if you’re feeling depressed, take a look at any of these incarnations. And feel the xtreme xcitement and joy of this classical, magical character. Next ›Need a quick Magically Real Fix? Never Fear! The miniature postmodern chivalric romance is here! For Kids! With Princesses!